It seems that every month sees me start in Geelong, where this time around I photographed a boring blue bus at Geelong station. The ‘GTS’ stood for Geelong Transit System and was the operating brand for public transport in Geelong between 1983 until 2000, when it was replaced by a mishmash of bus operator branding. Today no sign of it remains, Myki being the ticketing system, and the Public Transport Victoria livery has been applied to buses. 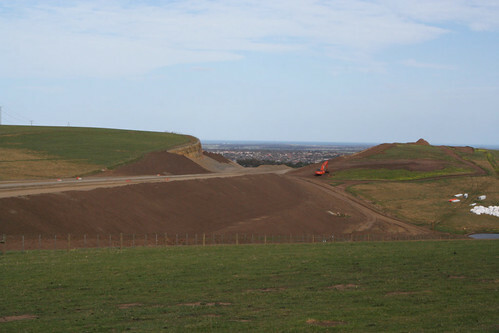 I also took at look at progress on the Geelong Ring Road through the Barrabool Hills. 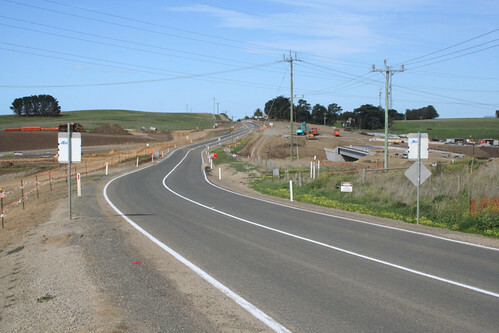 Barrabool Road had been slewed to one side, allowing construction of the bridge over the future freeway to be carried out without interference with traffic. 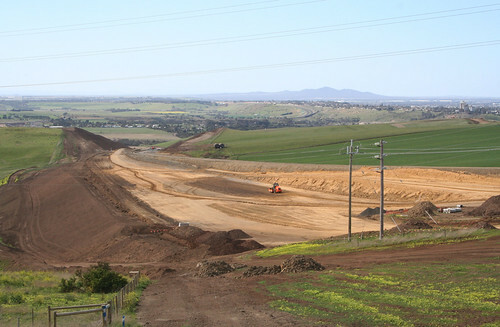 Excavation work on the long cutting towards Waurn Ponds was well underway. As was the massive climb uphill from the Barwon River. Another ongoing theme is the decline of rail freight – I found a rake of redundant superphosphate hopper wagons in storage at North Geelong Yard. As well as a rake of much older cement hoppers. Both were destined for the scrap yard – the superphosphate traffic was completely lost to rail in the early 2000s, but cement traffic was still barley holding on but in smaller volumes, hence the retirement of older wagons. But there was one new traffic that rail won – the transport of containerised mineral sands from the Iluka Resources processing plant outside Hamilton to the Port of Melbourne for export. 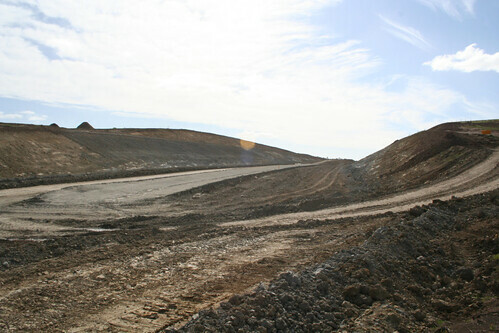 The service was run by small operator El Zorro, with the transport of the mineral sands between mine and processing plant also moving to rail in 2011. And another success was the transport of Geelong football fans to Melbourne, where they would see the Cats get thrashed by Hawthorn in the 2008 AFL Grand Final. A number of special 8 car trains ran between Geelong and Richmond during the finals seasons, with one of the trains on grand final day wearing a special ‘Geelong Cats’ headboard on the lead locomotive. Up in Melbourne I took a walk through Flinders Street Station, where Connex had opened a new customer information booth on the main concourse. The booth still exists today, just rebranded for Metro Trains Melbourne. I also photographed the ‘split flap’ Solari boards hidden on the main concourse, which once listed train departures for each line. Installed in the 1990s, the screens were decommissioned in 2007 but remained in place for a few years, hidden by advertising. Over at Southern Cross Station I followed a speedy piece of construction – a new loading ramp at the north end of platform 1. Built to enable the provision of motorail services on The Overland between Melbourne and Adelaide, two weeks later it was virtually complete. The first cars were loaded onto The Overland in February 2009, but today the ramp stands unused – the motorail service was withdrawn in November 2015. Finally, we end this month with a trip to Ballarat. In the small township of Millbrook I came across a level crossing on Old Melbourne Road, protected by bells and lights but no boom barriers. VicTrack funded a upgrade of this level crossing during the 2012/13 financial year, but the railway line is due to be closed in a year or two time, made redundant by the Ballarat Line Upgrade. On the shores of Lake Wendouree is the Ballarat Tramway Museum, where I photographed tram 33 departing the St Aidans Drive terminus. While a short distance away I paid a visit to the future Wendouree station site. The railway past the station was still being used by trains to Ararat, so the tracks were slewed away from the platform, allowing construction to be completed without delaying V/Line services. I also had a look at the Alstom workshops at North Ballarat, where the sidings were full of abandoned trains. I found Comeng carriages 1109T and 533M showing plenty of accident damage; as well as classmate 671M stored in a stripped condition, minus windows, doors, cab front and who knows what else. Comeng carriage 671M was eventually made part of a new MFB training facility at Craigieburn in 2014, while 1109T and 533M were scrapped in 2010. I also found Hitachi carriages 204M and 203M. But there was also signs of new life – Hitachi carriage 225M was under refurbishment. It reentered service soon after, remaining in service until 2014. Along with a number of Great Southern Rail carriages being upgraded for use on the Indian Pacific and The Ghan services. They also saw use on the ultra expensive Southern Spirit service that operated between 2010 and 2012. But we end some something I just stumbled upon – the abandoned Joe White Maltings factory at Wendouree. The factory itself had already been demolished, with the silos meeting the same fate in 2010. Houses now occupy the site. Iluka’s plant is 80km outside Portland. That is, 5km out of Hamilton. It would be like calling Corio, outside Melbourne. That was a brain fart on my part – the train itself ran from Portland to Melbourne, the loaded containers being moved from Hamilton to Portland by road, due to the lack of a rail loading facility at the time. It’s misleading to say that since 2008 in Geelong, Public Transport Victoria livery has been applied to buses. Although all CDC buses have had PTV livery applied, which seems to be CDC company policy, *not one * McHarry’s bus sports the PTV livery, which is obviously that company’s policy. Thanks for the correction – it seems an odd turn of history that McHarry’s held onto the GTS livery for so long, yet have rejected the change to the PTV livery. As for bus advertising, it’s interesting to compare the advertisements on the buses around Victoria. Melbourne buses usually have adverts for national or international brands, while the buses in Geelong, Ballarat and Bendigo only seem to advertise two bit companies that only people in a specific suburb would know about – pubs, car dealers, home improvements, real estate agents, housing estates, and so on.